Artist Judith Cottrell is the second artist to contribute to the San Antonio Unfiltered project. Be sure to check out all of her photos from the disposable camera in the slideshow at the bottom. Judith Cottrell grew up in a military family and traveled all over before landing back in Texas in the early 90s. She earned a BFA from the University of Houston and an MFA from the University of Texas at San Antonio, and has been a part of the local art scene ever since. When not creating art, she works as a surgical technician at South Texas Veterinary Specialists also known as VREC- Veterinary Referral and Emergency Center. 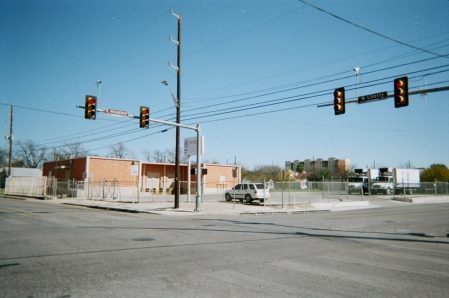 E. Houston and Cherry St – Tucker’s Kozy Korner (bar and lounge). Photo by Judith Cottrell. Judith’s Window Works exhibit at Artpace was one of the coolest that I have seen. She collaborated with a programmer to create a drawing machine (affectionately known as Mr. Drew) that would constantly draw images on the Artpace window. Blending technology and art in such a profound way raised some interesting questions about what it meant to create art. 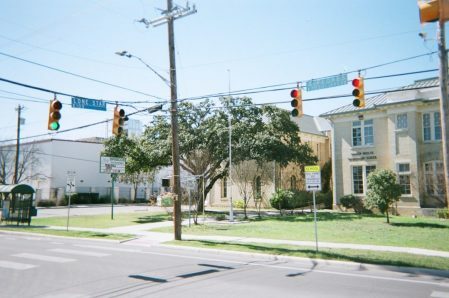 S. Flores St and Lone Star St – Lone Star Arts District. Photo by Judith Cottrell. 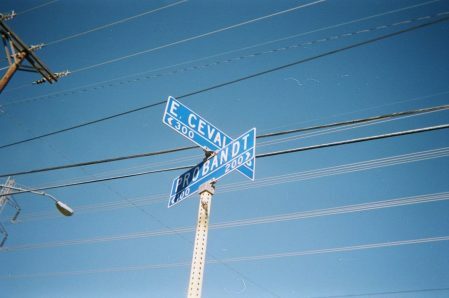 For her Unfiltered Project, Judith decided to focus on the street signs across San Antonio that held special significance to her, places that represent the SA art scene or restaurants she loves. Judith wrote that, “I thought just photographing the buildings would be boring. I guess people will just have to look up the street addresses to see what’s there.” Enjoy exploring all of her photographs, be sure to check out her exhibits and check back on the blog in March for the next Unfiltered artist! Cevallos St and Probandt St – La Tuna Grill and Bar. Excellent/Fun/Nice Hang-out spot. Photo by Judith Cottrell. The upcoming month is busy for Judith. At Luminaria on March 9th, she and artist Kim Bishop are going to have a huge installation of lamps that they have been borrowing from friends and folks around the community. Her current exhibit at Sala Diaz, called It’s Yellow, will have its final showing March 10th from 3:00 – 5:00PM. A huge thanks goes to Judith for being the artist to help coordinate the Unfiltered series! I was introduced to her by a mutual friend Andy Benavides to talk about another project when I pitched her my idea of giving artists disposable cameras to take pictures of San Antonio. She has been instrumental in organizing different members of the arts community to help with this project, and I am extremely grateful. Check out Judith’s website at www.judithcottrell.com for the latest information on her exhibits. Read about the origins of the San Antonio Unfiltered and check out the previous Unfiltered artist Kim Bishop.